This week I’m really looking forward to getting in solid workouts that combine cardio and TIU toning. And don’t forget that I’ve started a little challenge of my own – getting in 150 miles by the time I have to go back to school for my first teacher workday on August 15. I’d love for you to join me. I post my daily workouts on Instagram, so follow me (or look at the sidebar of this blog) to see what I’m doing! Happy Sunday morning! My weekend has been really fun so far. 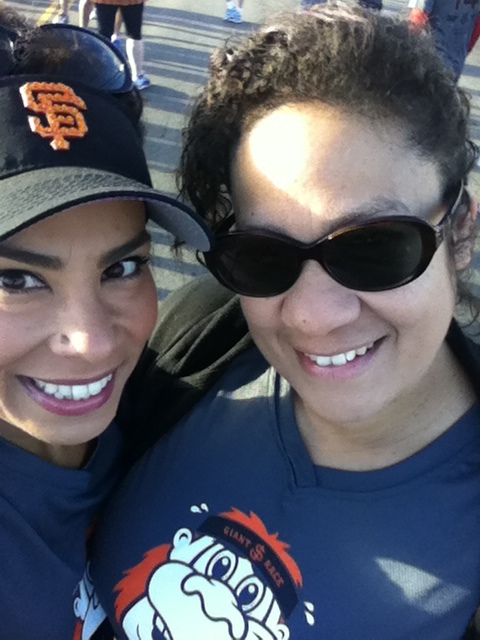 Yesterday I participated in the Giant Race 5K with my friend Di, and we had the best time walking and chatting. We liked it so much that we decided that next year, we’re going to run the 5-miler. The race started early – at 7:30am, which was good because it meant we avoided the heat and had the rest of our Saturday to ourselves. I really think the race shirts were adorable, don’t you? That’s the SJ Giants’ mascot, Gigante. The course itself was really flat for the most part, although there was one small incline. I definitely think that next year I’d appreciate the challenge of running the 5-mile race. One really cool aspect of this race was that the finish line took us onto the ballpark green. 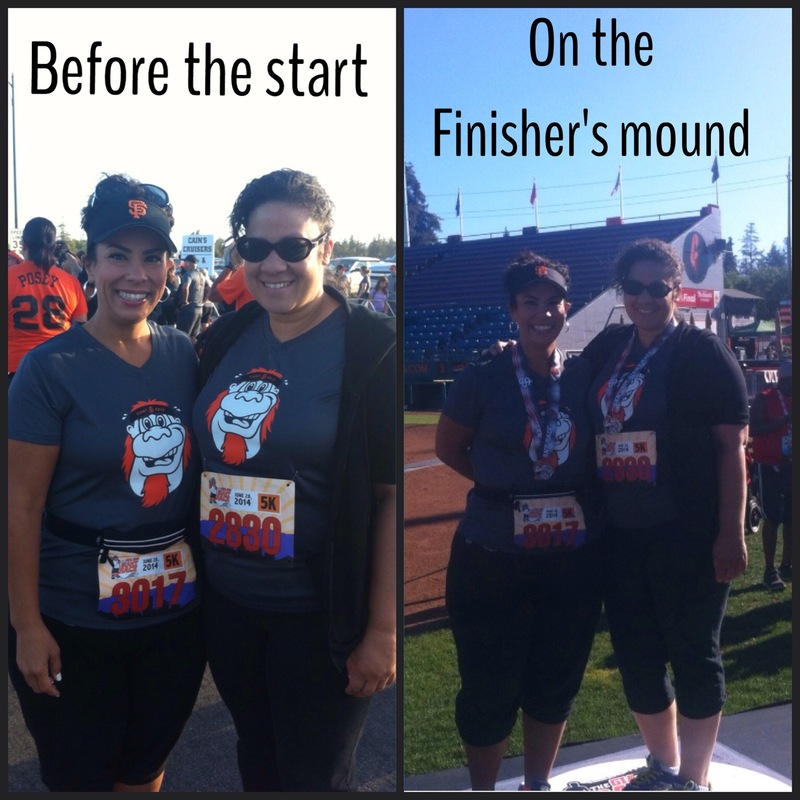 For a while I’d been questioning whether or not I wanted to continue participating in 5Ks. Whether I wanted to run them, walk them, or just skip them altogether. When I was doing my own run/walk intervals, I found myself nervous every time it was time to run, so I told myself maybe I should just walk 5Ks from now on. But every since I’ve re-started C25K, I’ve actually enjoyed the running segments. The difference is that I’ve slowed myself down and just focused on improving my breathing. 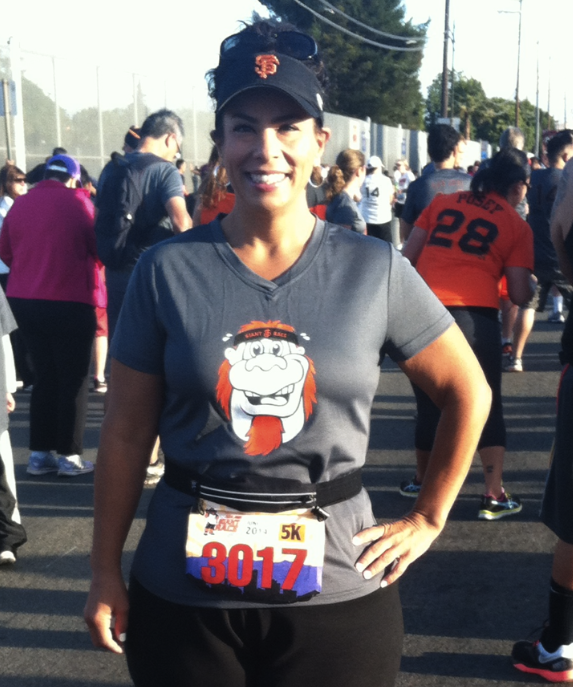 Yesterday’s 5K was fun, but not challenging enough for me. So I’ve decided that in the future, if I find a 5K that I want to participate in, I’m going to run it. (Hopefully I still feel this way after the MOOnlight 5K I have coming up on July 12, which will be the first 5K I run all the way through). ***Today, TIU had the suggestion of going to a yoga class this afternoon, or doing one of their yoga routines. I’m so thankful that they suggested this, because I remembered that I had 19 yoga classes that I’d purchased last summer and were about to expire July 31st. So, you’re going to see yoga on my schedule several times a week from now until then. Now that the Bikini Series is over, I thought I’d start a little challenge of my own – getting in 150 miles by the time I have to go back to school for my first teacher workday on August 15. I’d love for you to join me. Saturday: 1st day of summer! C25K, W5, D3 + TIU: Pink Flamingo (2 rounds) + swimming! Even though the Bikini Series will be over by Saturday, the great thing about Tone It Up is that the weekly workout schedules don’t stop. I’ll be following their toning plan throughout the summer, and beyond. I post my daily workouts on Instagram, so follow me (or look at the sidebar of this blog) to see what I’m doing! This week is bananas for me at school – busy days, and a few events in the evening, too. Which means several more days waking up at 4:00am to make sure I can fit these workouts in. It hasn’t been easy waking up that early, but I’ve been doing a decent job of it these past two weeks. Monday: stair workout (6 rounds up & down of 225 stairs) + 2.41-mile walk in 37:19 w/ mom + swimming/playing in the pool with nieces & sis. I’m going to try to walk Sofi on Wednesday – Friday in addition to these workouts, but it will just depend how the days go. I’m excited about this workout plan because it’s challenging, yet also doable. I like the variety in my cardio because I think it’s really important, and the TIU toning is really showing up. In fact, my friend Di said that I look really toned when she saw me on Sunday. Which means that even though my weight has remained the same, I think I’m losing inches and firming up. Plus, I have a lot of fun creating the photo collages and checking in on Instagram with the TIU community. This week’s C25K comes with 5 minutes of straight jogging, which is daunting, but I’m going to remember to s-l-o-w it down and just push through. My legs are never the issue; it’s my breathing that become difficult, so I know that slowing down will really help. As I mentioned in a previous post, my goal in beginning C25K again is to be able to wog/jog/run the MOOnlight 5K on July 12. Not run/walk, but to run it (however slowly) all the way through.